Allison Strong, shown at right, booked a guest-starring role on "The Blacklist" (NBC). 2015 HOLA Awards recipient Pablo García Gámez's award-winning play Noche tan linda (which won an HOLA Award in 2014) will be presented (and directed by Romina Oslé) by LugarOtro Estudio Teatral at the Teatro del Abasto in Buenos Aires, Argentina. For more information, click here (note that the link is in Spanish). 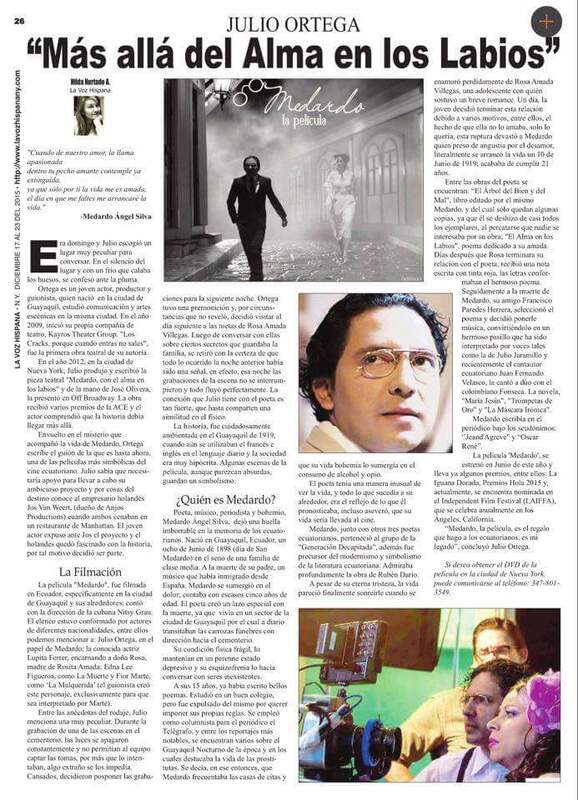 2015 HOLA Award recipient Julio Ortega and the 2015 HOLA Award-winning feature film Medardo (written by Ortega and directed by 2015 HOLA Awards recipient Nitsy Grau, respectively), was profiled in the New York daily newspaper La Voz Hispana. The film stars Ortega, Edna Lee Figueroa, Edison Carrera, Inma Heredia, Gloria Ospina and 2015 HOLA Awards recipient Juan Villarreal. To read the article, which is in Spanish, click on the image at left. 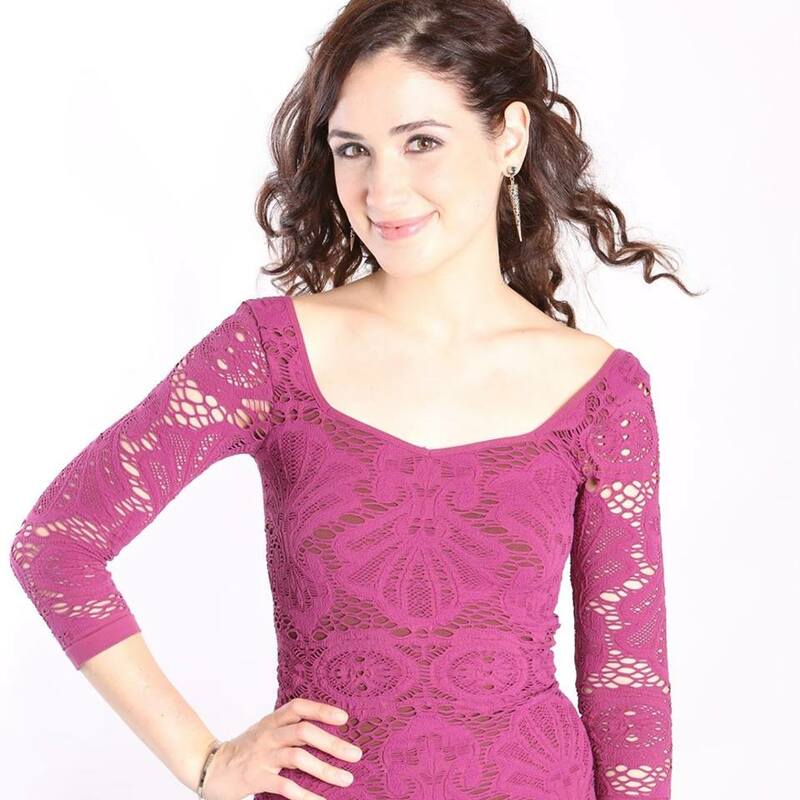 Caridad de la Luz (also known by her nom de poésie et de musique La Bruja) will share a bill with María Aponte and James "Peach" McCrory as they celebrate the fifth anniversary of the monthly event Bronx Stories. Hosted by Master Lee, the event will take place on Friday, January 8, 2016 at the Bronx Museum of the Arts, located in the Morrisania area of the Bronx. For more information, click here. Joel Pérez and Marrick Smith wrote the holiday song "Home's With You", which they sing with the rest of the cast of the Tony Award-winning Broadway musical Fun Home (adapted by Lisa Kron and Jeanine Tesori from the graphic novel of the same name by Alison Bechdel; directed by Sam Gold), currently running at the Circle in the Square Theatre. (Pérez originated and currently play the roles of Roy, Mark, Pete, Bobby, and Jeremy– Smith is his understudy.) The song can be found on the song collection Broadway's Carols for a Cure: Volume 17 (2015). Sales of the collection (a two-CD set) benefit Broadway Cares-Equity Fights AIDS. For more information (and to buy the collection), click here. To see a video for the song, click on the video below.